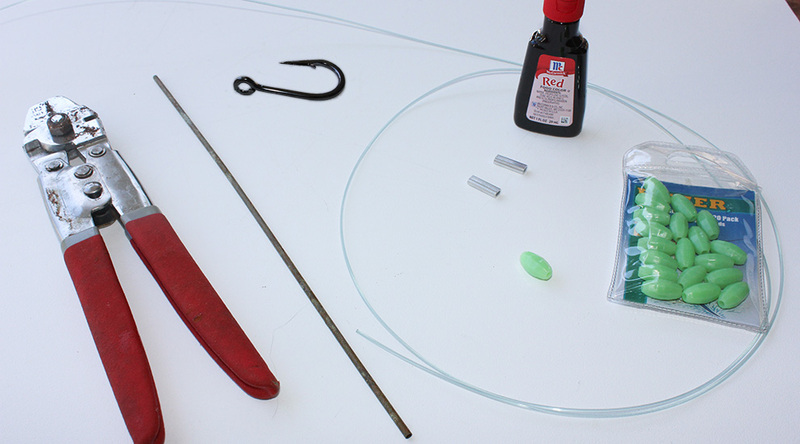 Swordfish can't resist a well-presented squid, and this quick squid rig only requires a few crimps and a glow bead to make a tasty offering for nighttime swords. 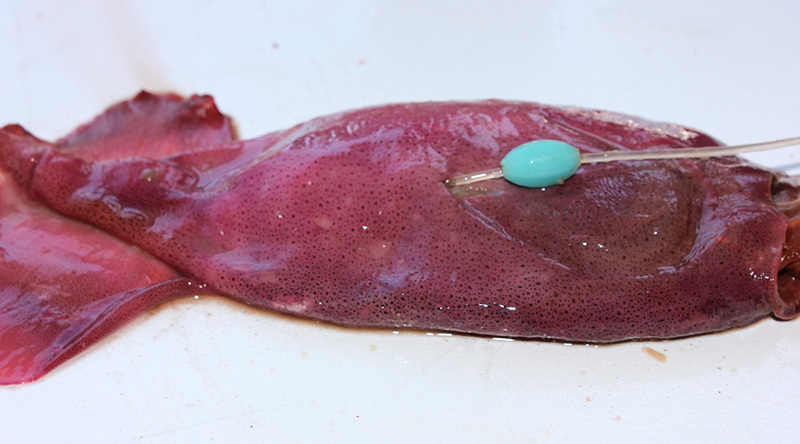 Purchased squid are often frozen and void of the bright colors they have in nature, so the baits used in this rig were dyed with food coloring prior to rigging. Text and photos by Meli Brock. Materials include a 9-inch squid, 9/0 to 11/0 big-game hook (sized to match your bait), 10 feet of 250- to 400-pound mono leader, 300-pound double crimps, 10mm glow bead, heavy-duty crimpers and red or green food coloring. Another great tool to have on hand is a section of 1/8-inch OD copper tube (found at hardware/hobby stores or online). Not shown: freezer bags for storing extra rigs and a bucket to dye your squid in. Slide two crimps onto the end of your leader followed by the hook. Leave a little slack at the hook loop and run your tag end back through the second crimp. Use your crimping tool to make two equally spaced crimps. The crimps should be placed away from the edge of the leader material so you don't nick your leader. Hold your leader up to the bait to determine where to place the second crimp. This crimp will keep the bead in place inside the tip of the squid. 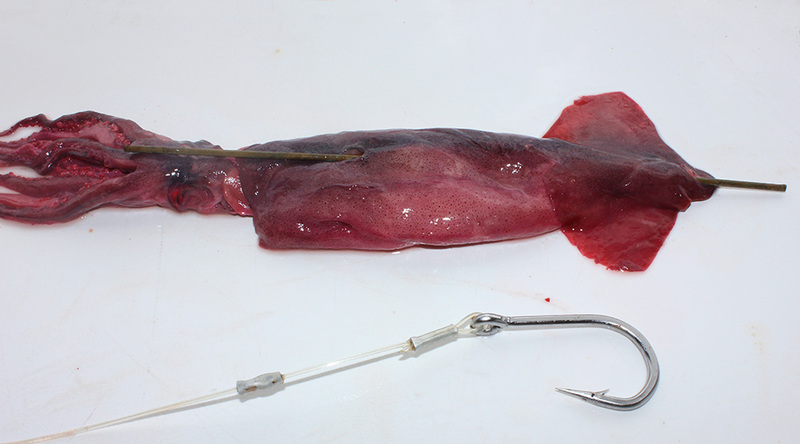 Then, use a knife to make a slit in the squid where the bend of the hook will exit. 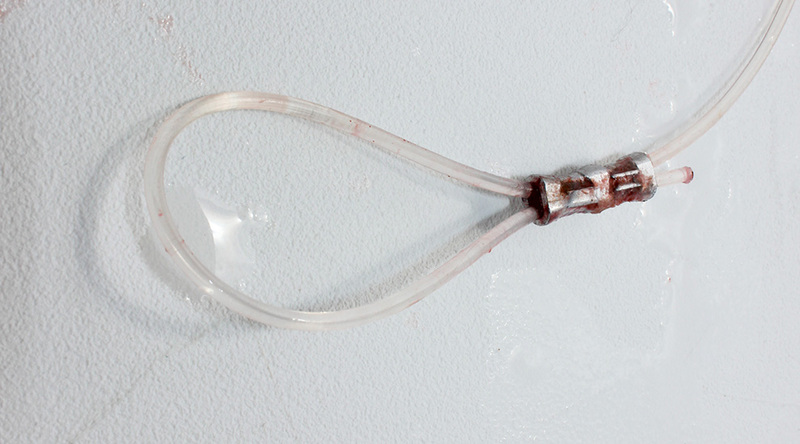 Slide the copper tube in the slit, through the body of the squid, then use it to pierce the tip of the squid. Slide the bead onto the free end of the leader and feed the leader through the copper tube. After feeding the leader through, you can remove the tube. 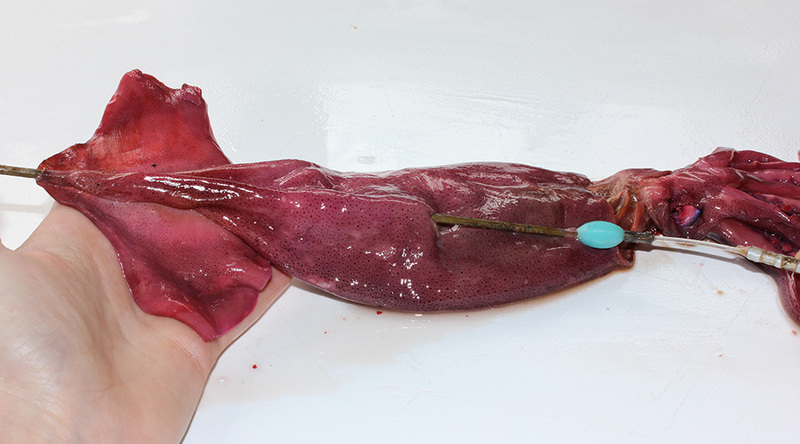 The slit you cut in the body of the squid should be just large enough to squeeze the bead through. Pull on the free end of the leader to seat the bead at the tip of the squid. The bend of the hook should now seat against the cut you made in the body of the bait. 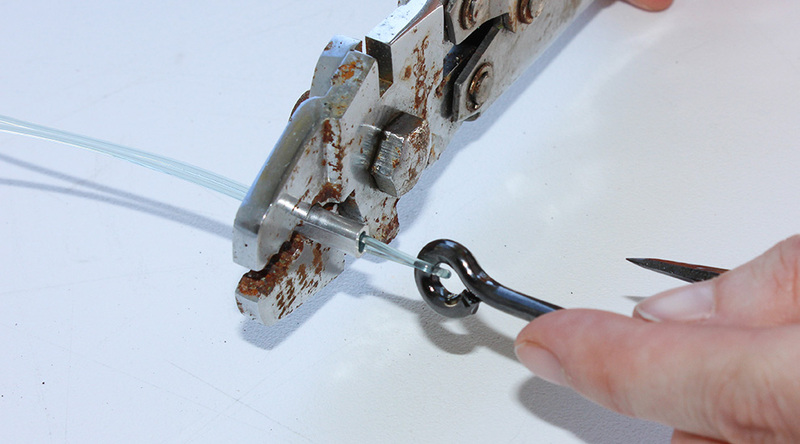 Use a double crimp to make a loop in the free end of the leader. This loop will attach to the snap swivel rigged to the main line. The finished squid is ready for action. You'll want to rig up a number of baits before heading to the sword grounds. 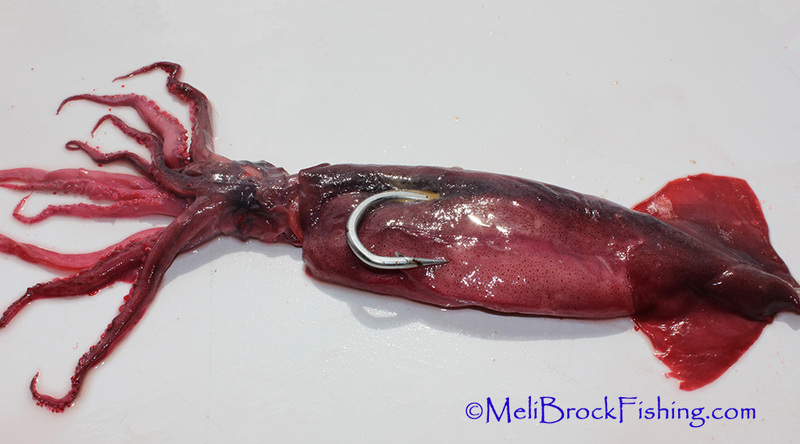 Rigged squid can be bagged and frozen for later use. 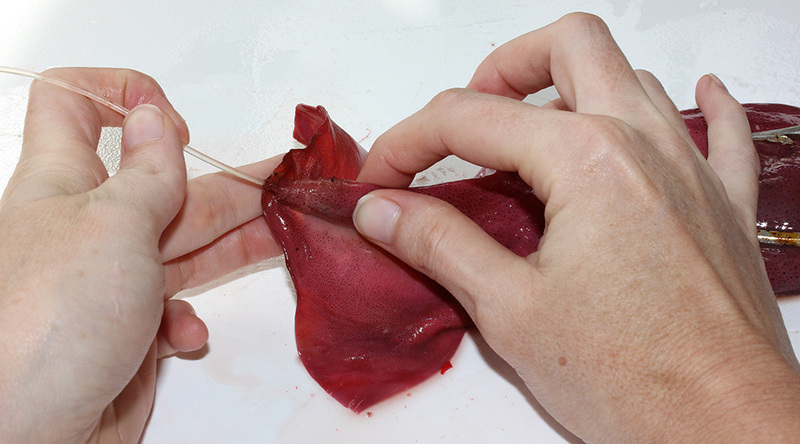 Wind your leader material in an organized loop and use a freezer bag to keep the bait fresh. 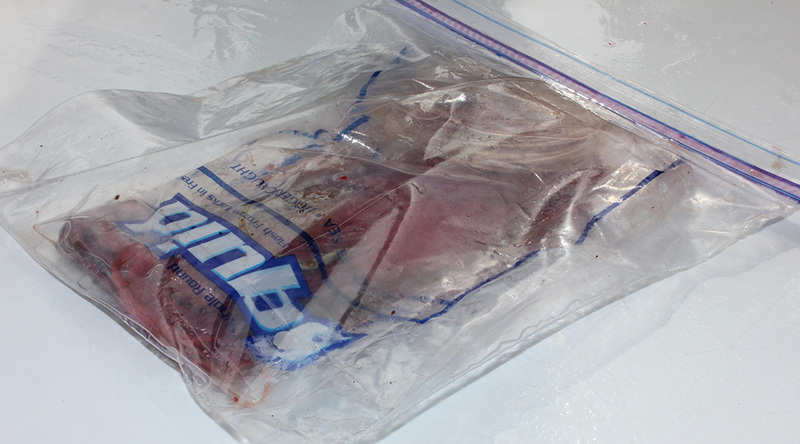 If you are really working ahead, you can use a vacuum sealer to store prepped baits in the freezer for up to six months. 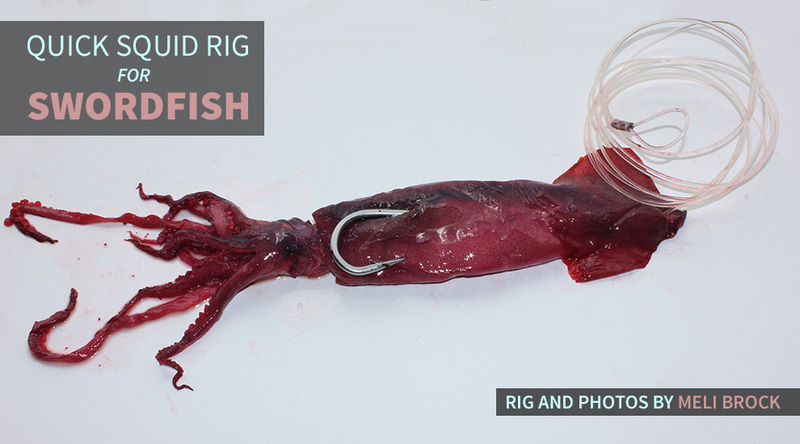 For tips on how to deploy this squid rig, check back soon for Part II in this swordfish rigging series. Text and photos by Meli Brock.